Winding cobblestone streets, flower-adorned balconies and arthouse cinemas: these are only some of the features that contribute to the Saint-Michel neighborhood's charm. Nestled on the west side of the historic Latin Quarter, this is one of the most-visited areas of Paris. Here, you’ll find tourists snapping endless shots of the dramatic St. Michel fountain and the iconic Notre Dame Cathedral, situated just across the Seine River on the opposite bank. This popular neighbourhood is home to some of the most gorgeous historic monuments and places in Paris, including the Pantheon mausoleum. And with the Sorbonne University, speciality bookshops and famed old cafes also clustered in the area, the neighborhood also draws eclectic crowds of students, intellectuals and sightseers. That means that it isn't all touristy. Despite its popularity, it still manages to reserve quiet nooks and places that seem curiously untouched by modernity. This is part of the reason why it remains such a draw card for tourists: against all odds, it resists being entirely colonized by the postcard industry. 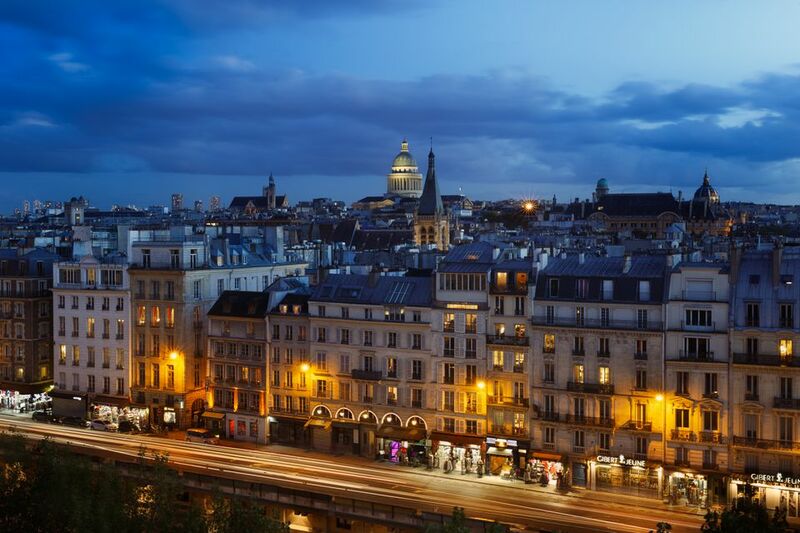 St. Michel is situated in Paris' 5th arrondissement within the historic Quartier Latin district, with the Seine River to the north and Montparnasse to the southwest. It's roughly sandwiched between the Jardin du Luxembourg to the west and the Jardin des Plantes to the east. Meanwhile, the fashionable, rather posh St-Germain-des-Prés neighborhood is tucked just west of St-Michel. To land directly at Place St. Michel: Get off at Metro St. Michel (line 4) and follow the exit to the square. You can also take the RER-C to St-Michel-Notre-Dame and walk south into the neighborhood. For the Sorbonne, Luxembourg and the Pantheon: Take the RER B to Luxembourg, or Cluny-la-Sorbonne (Line 10). The neighborhood has a long and rich history as one of the intellectual nerve centers of the city, stretching all the way back to the medieval period. The term “Latin Quarter” stems from the many clergymen and university students who lived in this neighborhood during the early Middle Ages times: they mostly spoke Latin as part of their vocation. While the universities in the area are no longer religious ones, their history is deeply connected to the seminary tradition. The Chapelle Ste-Ursule, which is one of the most architecturally impressive aspects of the Sorbonne university, was built in the 1640s in the Roman Counter-Reformation style. It was an early instance of the domed roofs which became widely adapted in the following centuries, and can be observed in many other historic buildings across Paris. Protesters first gathered at the Place St. Michel during the May 1968 demonstrations, the violent general strike that rocked France and halted its economy for weeks. Sorbonne: Founded in the 13th century as a religious school, The Sorbonne is one of Europe's oldest universities. The inner sanctum is off-limits to visitors, so you'll have to admire from outside. Pantheon: Originally dedicated to the patron saint of France, St. Genevieve, this church now serves as a burial place for some of the country's most esteemed characters. Hotel de Cluny: This medieval residence now houses the National Medieval Museum. The famous Flanders tapestry series, "The Lady and the Unicorn", is displayed there in a special low-lit room. The site is built on the foundations of roman thermal baths, part of which remain visible, and can be visited in the museum. If you've run out of English novels during your trip, head over to one of the most charming English-language bookstores in Paris. Lining the Seine, this quaint shop has everything from guidebooks to Kafka to the latest bestsellers. Come on a Friday night and you might catch a reading by a poet or novelist on the sidewalk out front. This is more than a mere bookshop: it's an iconic site. You might walk right past this inconspicuous bakery if you're not careful - but don't. What Pâtisserie Bon lacks in quantity it makes up for in quality. Intricately iced chocolate cakes, rainbow-colored macaroons, and tarts with berries piled high are some of the specialties. Nestled among lime trees and bubbling fountains, this typical French brasserie is a popular spot for Sorbonne students looking for a break from their studies. An older crowd moves in for the dinner rush. If you're searching for an alternative to classic French cuisine, try this inviting restaurant that specializes in Corsican dishes. Notable dishes include the swordfish carpaccio, gnocchi in a chestnut and mushroom cream sauce, or the steamed rabbit wrapped in banana tree leaves. These two Tibetan restaurants offer much the same menu and are right around the corner from each other. Try the steamed dumplings (momos), brothy noodle dishes or coconut rice dessert. Kokonor also offers Mongolian delights, like the delicious meat fondue. Tucked away off of Boulevard St. Michel is Rue Champollion, which houses three renowned arthouse cinemas offering independent or classic films. Le Champo has regular film festivals featuring a certain genre or decade, plus all-nighter screenings where you can watch three movies back-to-back and get breakfast in the morning for 15 euros. After your film, stop over at this arthouse café for a drink. With black-painted walls covered with film star photographs and guitar riffs playing overhead, you'll feel like you never left the cinema.